When Amrozi bin Nurhasin, the smiling Bali bomber, entered a Bali courtroom on the day of his sentencing, he was shouting "Jews, remember Khaibar. The army of Muhammad is coming back to defeat you." What was this Khaibar, and why should it be remembered? In the time of Muhammad, Khaibar was a fertile oasis in the Arabian desert. It was populated by Jews, who maintained its irrigation systems and lived off its produce. When Muhammad conquered the oasis in 628, the Jews who lived there managed to negotiate a surrender. The conditions of their surrender were that some of them could remain to tend the date palms and gardens, but in return they had to pay 50% of their harvest to the Muslims. The land itself would henceforth belong to the Muslim community. The Jews of Khaibar were also granted permission to keep practising their faith. Soon after, the Arab Christians of Najran were forced to accept the same conditions. The right of the Jews of Khaibar to stay on their former lands was a temporary concession, withdrawn in 640 by Umar, in obedience to Muhammad’s dying wish: ‘Two religions shall not remain together in the peninsula of the Arabs’. In this same year the whole of Arabia was cleansed of non-Muslims. The discriminatory shari’a regulations applying to non-Muslims, who are referred to in Islamic law as dhimmis, are based upon the precedent of Khaibar. Through a twist of history the defeat of the Jews of this little-known Arabian oasis helped determine the treatment of many millions of non-Muslims after Islamic conquest, including the once-vast Christian populations of the Middle East. For this reason, the name of Khaibar has great significance for us all. For extremist Muslims like Amrozi, it stands for the defeat of infidel enemies, and their humiliation and subjugation under shari’a conditions, an enduring signpost to the hope of an Islamist victory. For non-Muslims this name stands for centuries of obliterated history and oppressive discrimination, referred to by Bat Ye’or, historian of the dhimmis, as dhimmitude. 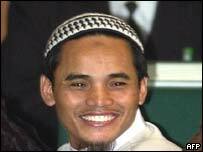 Amrozi the smiling terrorist was right — we should all remember Khaibar, as a turning point in world history. Today the precedent of Khaibar continues to shape the lives of the Jews of Iran, the Copts in Egypt, Africans in the Sudan, Pakistani Christians, Hindus and Zoroastrians, and many more. Widespread discrimination against non-Muslims is endemic in Islamic nations, to a significant degree, and there are signs that the problem is getting worse in the twenty first century, not better. Amrozi’s laughing face has been constantly on the front page of Australian newspapers in recent months. The grief felt over the casualties in the Bali attacks is profound. So it was a irony that, when the Australian newspaper reported Amrozi’s words on the day after his sentencing, the editors did not recognize the name of Khaibar and misspelled it as Hibah. Despite its landmark significance for interfaith relations, the name of Khaibar now seems to be forgotten, its significance obscured. The fate of the Jews of Khaibar had momentous consequences for world history, yet this page of history has been torn out of the non-Muslim world’s collective consciousness. It is time for it to be returned to its rightful place. well done for posting this. for it is this event that outlines the definitions of the "hudna". for anyone who doesn't know, the jewish men of the village were executed by beheadings, something which we still see carried out by muslims today, from the far east where christian schoolgirls are beheaded, to iraq where christian missionaries are beheaded all the way to bosnia where the muhajideen were beheading serbian christian men, woman and children under the blind eye of western journalists and the UN. Islam finds its most useful "cannon fodder" amongst deranged bicycle repairmen and those in prison. Excellent post. I really enjoy posts that give an accurate history of Islam. The Khaibar Jews were more fortunate than the Qurayza Jews, but living near or under the yoke of Islam was a nightmare in those days and in the present as well. As for the smiling demon who murdered innocent people in a nightclub, may he burn in the hottest part of Hell along with his False and Evil Prophet. Would like to link to this post, explaining the Khaiber murders.